Integrate your YouTube account with Rank Ranger for enhanced YouTube Analytics reports that can be viewed in our marketing platform, white label client dashboards and automatically sent in white label PDF format to your clients and managers. Authorization is quickest if you are logged into your YouTube account in another tab / window prior to connecting the account to Rank Ranger. Click Settings in the top right navigation or hover over the person icon and select My Account. Scroll down to the Connections section of the sidebar and click Authorized Connections. If no connections have been previously added to your account, you will see a blank Manage Connections table. Click the Add Connection button to expand the option list. If more than one Google YouTube account is accessed with the computer or device you're using, then Google will ask you to choose an account. In order to provide you with YouTube Analytics reports and tools, Rank Ranger requires your authorization to view YouTube reports for your channels and videos, playlists and activity for display in your social analytics reports in our marketing platform. 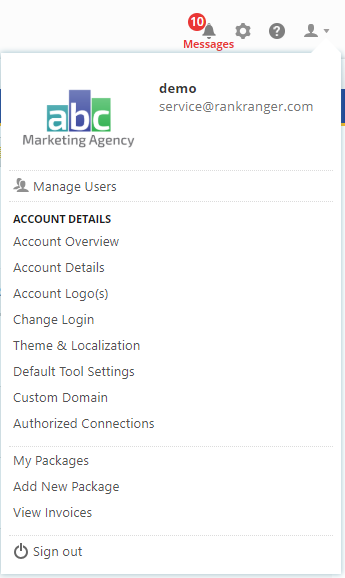 Click the i icon to review the more information regarding the account permissions. Click the OK button to close the window. You can add as many YouTube accounts to Rank Ranger as you'd like, so we recommend that you name each connection for easy identification when connecting to rank tracking campaigns. Learn more about managing your Authorized Connections. After authorizing integration of your YouTube account to our app, you need to connect a YouTube profile with a rank tracking campaign. In the Select Connection Name for YouTube field, click the down arrow and select the appropriate account. When the connection is successful, you will see the YouTube account avatar and name (if you don't then you need to click the Connect button). To switch to a different YouTube account, click the Disconnect link and repeat the campaign connection. Click the View Report link to launch the YouTube Channel Analytics Dashboard. When available, you'll find additional YouTube reports and tools in the left sidebar of the Reports > Social Analytics screen. Third party data can be used to create individual or blended metrics Insight Graphs and Single Metric Widgets, and is also available in a wide variety of reports.